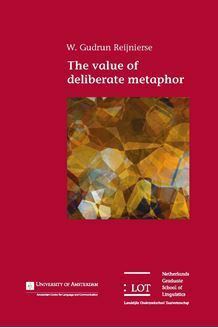 Over the past decades, metaphor has predominantly been studied as a matter of language and thought within the framework of Conceptual Metaphor Theory. Recently, however, metaphor scholars have observed that this two-dimensional cognitive-linguistic view of metaphor does not (sufficiently) accommodate the role of metaphor in communication. They argue for a rehabilitation of more rhetorically-oriented approaches to metaphor in which the role of metaphor as metaphor in communication between language users is central. This thesis investigates the communicative dimension of metaphor within the developing theoretical framework of Deliberate Metaphor Theory (DMT). DMT extends the two-dimensional model of metaphor with a dimension of communication in which a distinction is made between ‘deliberate’ and ‘non-deliberate’ metaphors. Specifically, this thesis contributes to the further development of this three-dimensional model of metaphor by addressing a set of key methodological and empirical issues regarding the role of deliberate metaphor that are currently in need of clarification. To this end, the first part of this thesis is concerned with the establishment of a reliable method for the identification of deliberate metaphor in language use. In the second part, the manifestation of deliberate metaphor in natural language use is described from both a quantitative, corpus-analytical perspective, as well as from a qualitative perspective. Finally, the third part of this thesis examines the effects of deliberate metaphor on reasoning. Together, the studies carried out in this thesis demonstrate the value of deliberate metaphor, adding to the growing body of research on the role of metaphor as metaphor in communication.